Not only is the food lineup impressive, so is the vetting that gets the “chosen few” one of the coveted vendor slots on Festival Street. Early in the spring, vendors must submit an eight-page application, and if selected, be prepared to pay a booth fee, attend mandatory vendor meeting, provide proof of insurance, receive health department training, purchase a food handler’s permit, adhere to a strict dress code and provide green, recycled paper products. Even with all these requirements, the Festival still receives twice as many applications as they have room to accommodate. To remedy this, and spread the love, the Festival rotates vendors amongst the mix of nonprofits and for-profits. If you don’t see your favorite vendor this year, chances are you’ll see them again next Festival. Coordinating Festival Street in no easy feat, but thanks to Co-chairs Gary Peitz of Dish and Dave Vermeer (who operates the North Idaho Fish n’ Chips booth), it’s a well-oiled machine. Besides looking after their own booths, these well-seasoned mentors, along with Carol Winget of the Festival, are always available to offer sound advice to new vendors and keep things humming on Festival Street. Last year’s new kids on the (Festival) block, Wildwood Grilling, proved to be a great hit with the crowd, and this year, though they don’t have their own booth, they’ll make a one-night cameo appearance at Evans Brothers Coffee. They’ll be grilling cedar-planked peaches, served up with Wildwood Amaretto & Alder ice cream from Panhandle Cone and Coffee, and topped with fresh blueberries from Shingle Mill Blueberry Farm. Don’t forget, it’s a one night performance only (George Thorogood on Aug. 12) and remember that their proceeds will be generously donated to the Festival at Sandpoint. 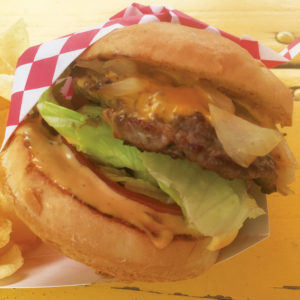 I’m not sure where Jimmy Buffet found his famous cheeseburger in paradise, but I do know you’ll find a burger worth singing about at the Old Tin Can booth, expertly grilled by Savanah and crew, and loaded with local produce. 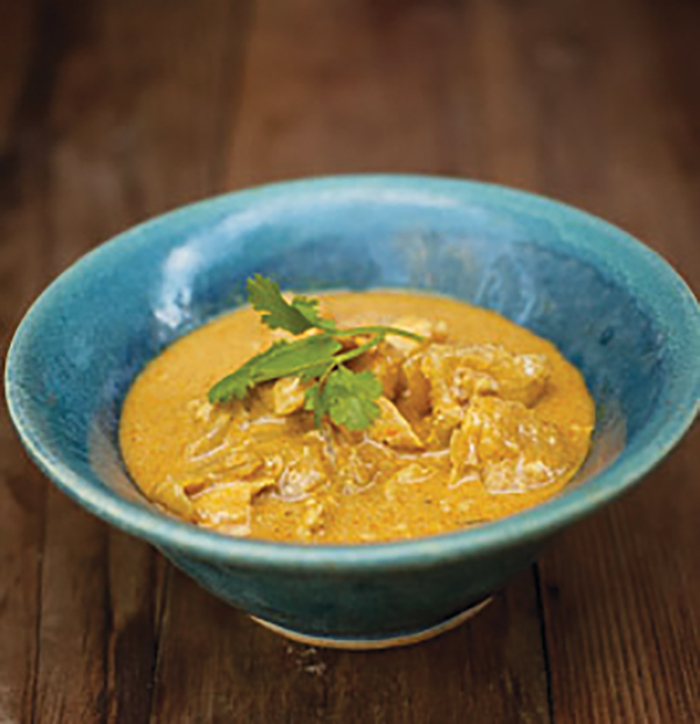 Another Festival newbie, but a welcome addition to the ‘hood, is Sandpoint’s Curry in a Hurry. Pete Hicks will be heating up some nice spice and preparing several of the dishes we’ve come to love, including my favorite, coconut chicken curry. Whether you’ve got a hankering for Bruno’s Country Ribs from Klondyke (pair ‘em up on Aug. 5 with Jake Owen and a Jim Beam special from Conlan’s bar) or prefer an organic vegetarian choice, lovingly prepared by our friend Laura at Jupiter Jane, you’re guaranteed to find a meal pleasing to your palate and your pocketbook. I’ve been waiting for tonight’s performance, the return of my beloved Pink Martini. Festival bar manager Jenni Hewitt was quick to tell me that she’s providing a repeat performance, too — the return of the celebrated Pink Martini (the original signature drink of the Festival), in a light up glass. Besides martini’s, you can purchase wine by the bottle and champagne by the split. Jenni’s enthusiasm is contagious, and it’s easy to see how she draws such a great lineup of volunteers. And wherever you end up looking for a cool one, I can guarantee that Jenni and her bevy of happy helpers will be pleased to serve you. Try the Lakeside Lounge, or, to avoid multiple trips to Conlan’s Bar purchase a ”bucket of beer.” Five brews for $25, that’s a good deal. Speaking of libations, it seems Dyno and crew have thought of everything, including an anomaly in the concert world: Bring your own bottle. Heck, you can even bring your own picnic. Whether you choose to spread an elaborate spread on a blanket under the stars, stretch out in a lawn chair (bring yours or rent theirs), or try out the new grandstand, you’re going to have a good seat and a great time. If you’re thinking of a home-packed picnic, you might choose to bring one along for the Family Concert (Aug. 6) or the Charley Packard Memorial Concert (Aug. 9), as vendors will be limited on those two evenings.